Since 1989, Bert and Sheila have been active in starting, building and leading ministries and churches in Canada and the United States. Sheila, a native of Kitchener, Ontario, joined a church planting team that started a campus church at the University of British Columbia. Bert, a student from Port Alberni, B.C., studying there, was one of those reached through these efforts and became a leader in the fledgling campus church. Bert and Sheila also met and married at this campus church. 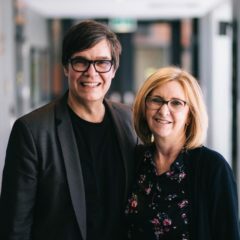 In 1989, Bert left his career as an optician in Vancouver as they both began to feel the tug in their heart toward Calgary to pursue the dream of pioneering a church at the University of Calgary (U-Church). In 1994, when Every Nation Ministries began, U-Church became one of the founding member churches. In 1998, Bert and Sheila were asked to move to Nashville to help with Every Nation Churches and Ministries North American headquarters. In Nashville, Bert served as the executive pastor of Bethel World Outreach Church and then for five years as the executive director for Every Nation Ministries. However, Bert never lost his heart for Canada and continued to give oversight to Every Nation’s efforts in Canada, helping start churches in Vancouver, Montreal, Ottawa, and Toronto. Bert enjoys small wood working projects and Sheila is never without a good book to read. They have four grown children, two of whom are pursuing their careers in the United States.